2015 is the year when you need giving your kitchen a bold and colorful upgrade. In the past, we made use of dull and decent colors while decorating kitchens however in 2015, we’ll see more interior designers making use of bold and contrasting colors at kitchens. The cabinets are going to be in darker shades whereas the panels and other woodwork would be in contrast with them. In short, the perfect balance of bold colors would define the kitchen of 2015. Since your kitchen is no longer a place just for cooking, it needs to be well-lit to ensure remarkable experience during parties and celebrations. This would help you keeping up with your culinary adventures. In addition, the perfect lighting in your kitchen this year would ensure perfect place for conversation and mingling to happen at get-togethers. In short, the industrial style lighting is the latest kitchen decor trend of 2015 as per leading interior designers in Lahore. When it comes to the practical utilization of a kitchen, the interior designers are putting all their efforts on maximum efficiency. The pantry shelves that take up all the essential kitchen items need to be your biggest priority while you plan upgrading your kitchen. It’s time to pull out the pantry shelves and enjoy the greatest convenience while cooking and eating in your kitchen. Besides, the use of built-in microwave ovens that are designed to fit in with your kitchen decor is getting more into trend to save maximum shelf space and ensure convenience. There can’t be anything better than having a maximum number of drawers and cabinets in your kitchen. If you don’t believe, ask one of the housewives and she’ll tell you why. The latest kitchen designs of 2015 include not only more drawers but the addition of vertical cabinets and drawers too. This would make it further convenient and easier to store kitchen accessories and crockery with ease. The interior designers and construction companies in Pakistan are using this technique to bring in more elegance and convenience in lives. Gone are the days when ordinary chips or even the marbles were used in kitchen flooring. The modern kitchens are going to see vinyl wooden flooring or larger ceramic tiles as a part of flooring. 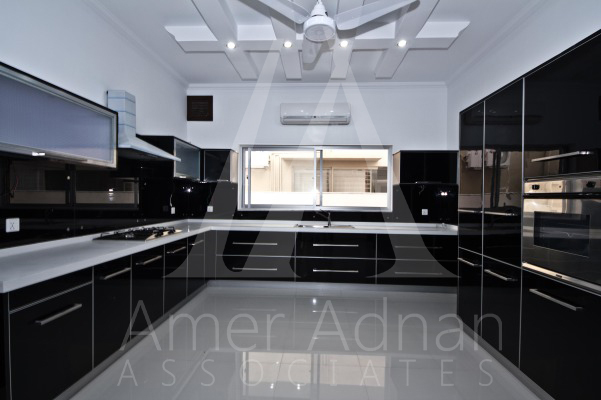 This would not only infuse modern look but would also make the kitchens more appealing and welcoming. However the practicable idea is to use marble tiles in kitchen since they are easy to clean and maintain as compared to the vinyl/wooden floors and ceramic tiles.